The BoBunny Blog: Day 7 giveaway, Shop Hop Photos, AND Layouts! Day 7 giveaway, Shop Hop Photos, AND Layouts! The day 7 giveaway is now open for entries! What would you scrap with these Lemonade Stand goodies?? 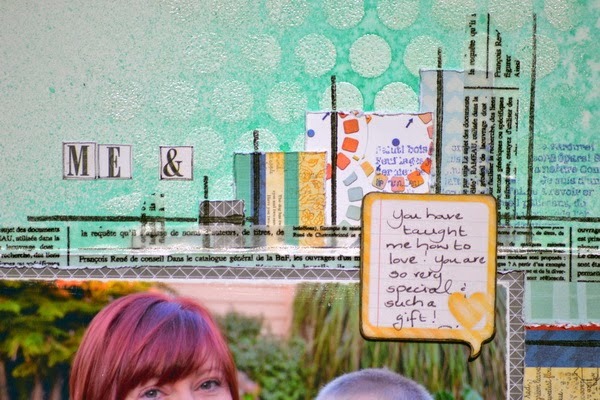 Are you excited for National Scrapbook Day tomorrow? OH! and don't forget that we will be announcing 5 winners of our 40k 40 day giveaway as well! It should be an exciting day!! Yesterday Bobetts Vick and Liz had a wonderful time visiting 5 of the 9 stores participating in the Utah Shop Hop! Here are some fun pictures of our adventure! Our first stop was Treasured Memories in West Valley, UT! We loved the enthusiasm of the shop hoppers! Our next stop was Heartfelt Creations in Sandy, UT They have an incredible crop room! Corey and Carley are visting the other 4 stores today! Pictures to come soon! May is going to be a busy month! Our design team is hard at work to bring you beautifully designed projects to keep you inspired through the spring and summer seasons! 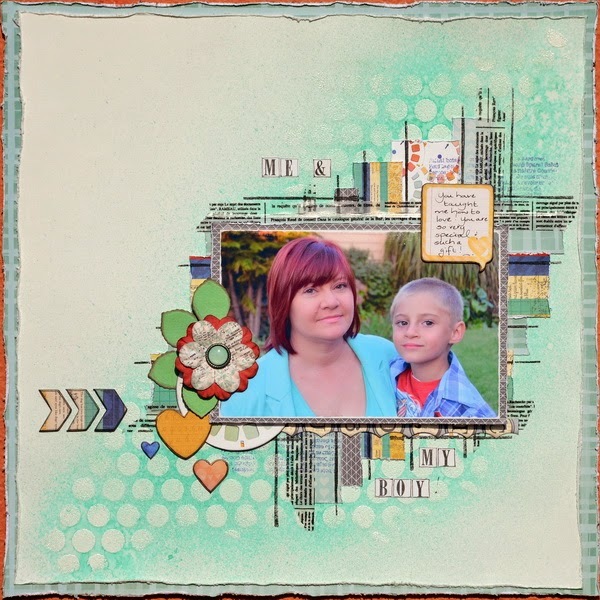 I created this layout using 4 collections - Baby Bump, Pop Quiz, The Avenues and Modern Miss. I love that these collections are so versatile and can be mixed up to create a page, with such a great, finished look. I went with a fresh and modern design, which compliments the 3 main collections nicely. In this design, I was also able to use the fabulous washi tape, which is my new "go to" BoBunny supply! I simply love it! 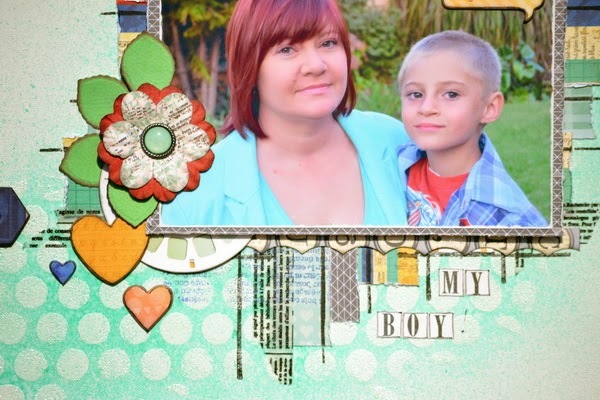 Since this page is about my son and I, I kept the flowers to a minimum. Here I used BoBunny petals, more of the chipboards and diecuts as embelishments, to keep the styling more general. I also used stamps on the background to add little touches of interest. This little journalling chipboard was just perfect for my thoughts. It really tells the story of this page and photo! My son gave me the "thumbs up" on this page, so I was really thrilled about that! I used a combination of Baby Bump and Pincushion collections, because "Gray" fit in both collections, by using a gray background, we connected the two collections. Design of pregnant women were drawn to the paper. But because I have used a photo of my daughter, I have placed a photo to hide a pregnant woman. 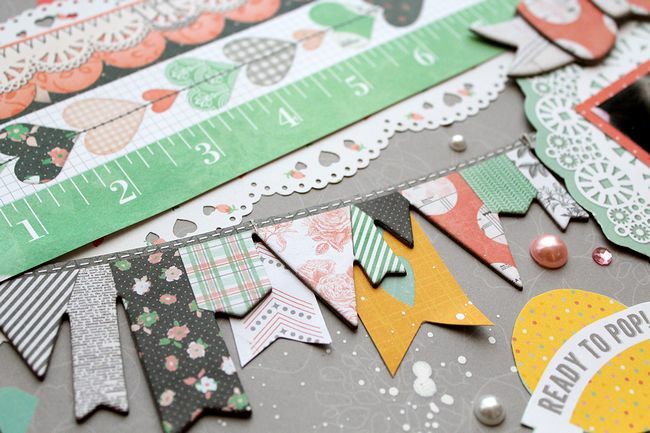 I added the yellow flag of Baby Bump collection to the chipboard banner of Pincushion collection. Well I love a good scrapbooking challenge as much as the next person, and love it even more when I get to use brand new BoBunny collections!! 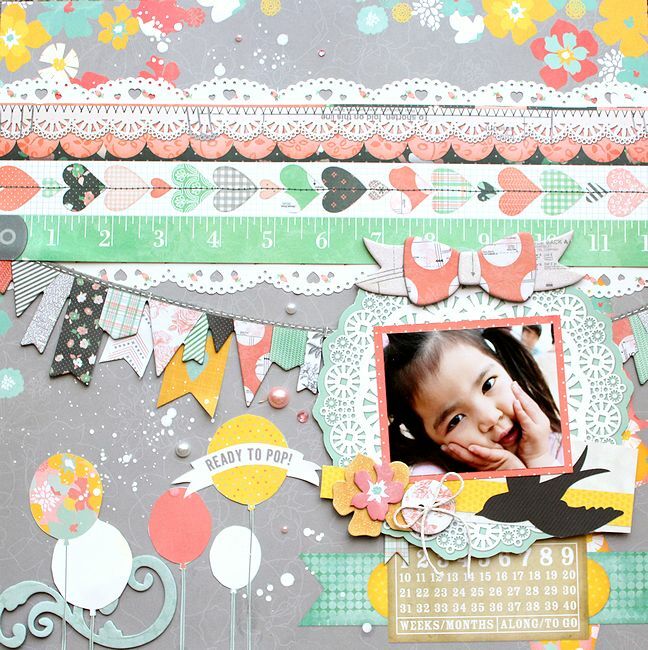 For this layout I mixed the Modern Miss woodgrain paper background, with the soft and delicate Primrose collection. I took the time to fussy cut the "Primrose Bliss" paper, which is full of these amazing butterflies in all different sizes and in gorgeous soft tones. 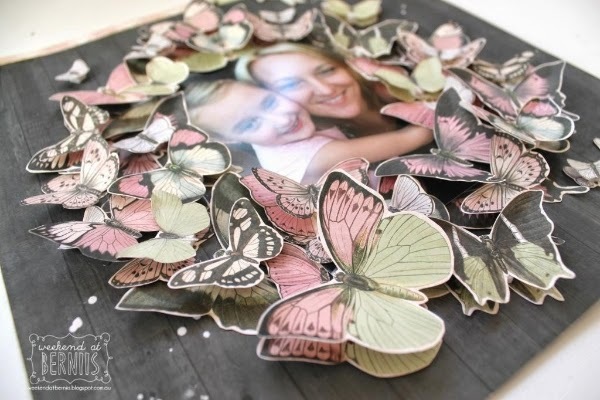 Against the richness of the Modern Miss wood grain paper the butterflies really stand out. I then simply used my photo as a starting point and layered all the butterflies around until I was happy with the feel. Then for extra dimension I used some foam dots and either used matching butterflies , or slightly smaller butterflies to " double up" on some butterflies. looks like an awesome road trip, great layouts, thumbs up on the butterflies. I would use the Lemonade line to scrap my precious granddaughters! Love these goodies - especially the jewels. I would use these on my scrapbooks. I'm working on "The ABCs of ME" and these colours would fit right in! All the layouts are beautiful. The butterflies one, though, made me sit up and say WOW! Gorgeous!! The time it took to fussy cut all of the butterflies really paid off. The bright colors of the Lemonade stand goodies would look great on any summertime layout. Love the very colorful jewels. I would use Lemonade Stand to scrap summer pics. I love the coordinating jewels the most. I LOVE lemonade stand!! Love the colors and everything about it! I would definitely do summer pages and spring. Love the fun bright colors - perfect for the summer pictures. Love the colorful papers in Lemonade Stand!! Awesome layouts.......thanks 4 chance 2 win!!!! Loved my girl and the last one was cool too with the butterfly wreath! Both projects today are beautiful! The juicy colours are perfect for a summer mini album for those favourite summer photos! These are fabulous projects!! Fussy cutting is always worth the time investment. My favorite Lemonade Stand product is the ephemera. Oh my gosh I love the colors for summer! Since 3 of my grandsons have summer birthdays (June, July, and August) I think I'd just have to scrap them with Lemonade Stand - seems perfect to me! Love the teal and polka dots in the layout. Ooh, wish I could get my hands on those goodies! Great-looking projects by your DT! Lemonade Stand's colors are my favorite - love the rainbow happiness going on! The papers are my fave. BTW, I must add that I LOVE each of those layouts! I really like the variety! Definitely fun stuff! I am so in love with the butterflies. The lemonade stand would be awesome for summer holiday pics. today i like that miscellaneous packet---i see buttons and lots of other fun stuff! TFS! I really like the butterflies and colors. I can see all these used on my cards. I LOVE the lemonade stand and cloud papers!!!! SO cute. I have a pattern for a paper pieced lemonade stand, it's going to be SO cute together!!! this fabulous summer theme line! Very Happy, happy colours! Lemonade Stand collection ROCKS!!! So much fun to scrap summer! Lemonade Stand collection is perfect for summer photos! Thanks so much for your 40K give away-- your supplies are awesome! I especially LOVE all your Noteworthy products. love the colors in this line...those butterflies are to die for!!! 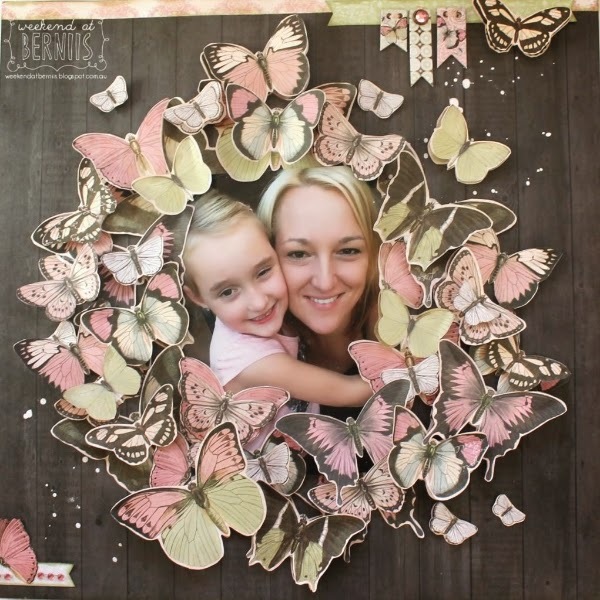 Beautiful use of the butterflies! I love the lemonade ephemera pack! My favorite are the super fun papers! The whole set! But especially the jewels! I love the variety of bright, summery embellishments. My fave Lemonade Stand product is the Collection pack! I would use it for my summer cards...don't do much scrapbooking! I just love the jewels! Really look like lemonade to me... :) The ephemera looks very nice too, and I don't think I've ever seen it in my local scrap shop. Not for any collection, I mean. Love those bright colors of Lemonade Stand Collection! Looks like a great collection! Perfect for card making! I love the fun colors and designs of the papers! Oh Bernii, what a stunning layout!! Love the butterflies. With lemonade stand I'd finally put all last year summer photos together. So bright and shiny, just like lemonade stand. I love the lemonade collection kit!! So awesome with 12x12 papers!! Looks like you had lots of fun going to all the stores. Love the layouts. I love the vibrant colors and patterns on the papers. I wish we had more local scrap stores so I could do a shop hop - it looks like so much fun! I love all the layouts, especially the first one. I love that the collections work so well together - so often that isn't the case! Gorgeous colors in this collection and I am in love with the ephemera! I like the accessory packages they have! 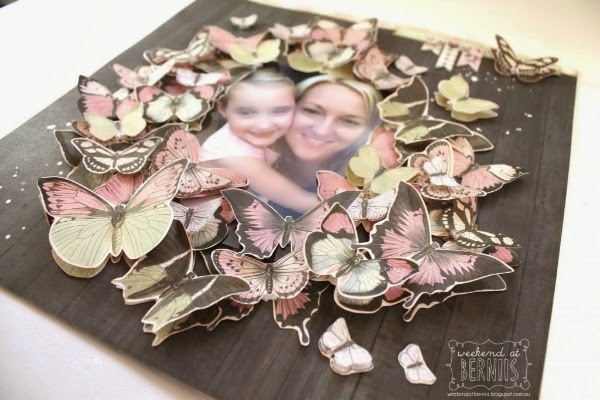 Love the butterfly layout! Love the colors of the summertime Lemonade Stand papers! Love the whole line! #1 is Lemonade Stand Ephemera! Woo hoo! The ephemera pack & the Noteworthy die cuts are awesome! Love the tidbits almost more than the paper. Planning a full day tomorrow in my studio. Naturally, it is supposed to be the first sunny day in MN in 2 weeks! 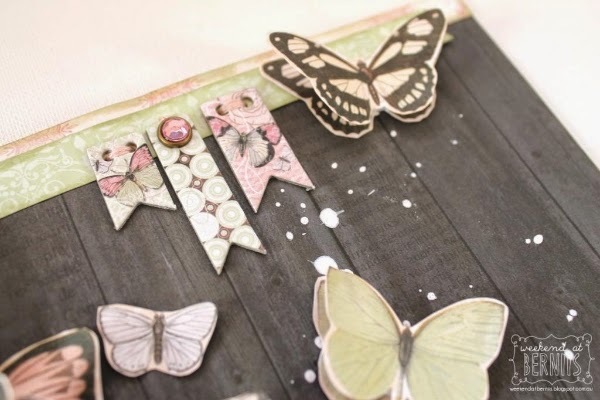 I am a fussy cutter at heart...LOVE the butterflies!!! Love everything about the line...primrose is standing out like crazy! I love the colors of lemonade stand! So bright and fun!! Oh I just love butterflies! Great inspiration. Love the new colored jewels and all that wonderful lemony goodness throughout the whole collection. Today's layouts are so cute and so well done. I love it all. Such bright cheery colors and patterns! The Ephemera pack is like a small pack that's about to burst out with LOADS of fun!! :) LOVE IT! I love the beautiful pattern papers in Lemonade! That butterfly LO is amazing. I have never seen anything like that. love the papers and jewels! There's no way to pick just one. Love all the colors goodies summerness!!! So pretty!!!! Just love the Lemonade Stand Paper Line. Bright n beautiful colors n patterns perfect for any summer occasion. It's hard for me to pick between the jewels and the epherema. These layouts are amazing!!! I am crazy about the patterned papers! I would like to use Lemonade Stand for some old 1990 picture with my now grown up son. I have so much love brigt pictures of him in the zoo, on the kiddy farm etc. Very fitting. Lots of succes Bo Bunny, stil love all your lines!!! Love Lemonnade Stand! All of it! The ephemera pack is my favorite, but it is definitely hard to choose just one piece - love the color! Lemonade Stand is such a fun collection. my favorite is the 6x6 paper pad. My favorite is the ephemera!! Love the variety and bright colors!